Jack Wernli started development of the Model 600 series of products that was eventually introduced in 1954. The 600 used 7-inch reels. It was both portable and light weight at only 27 pounds. At 7.5 ips, its recording/playback quality equaled that of the Model 400. 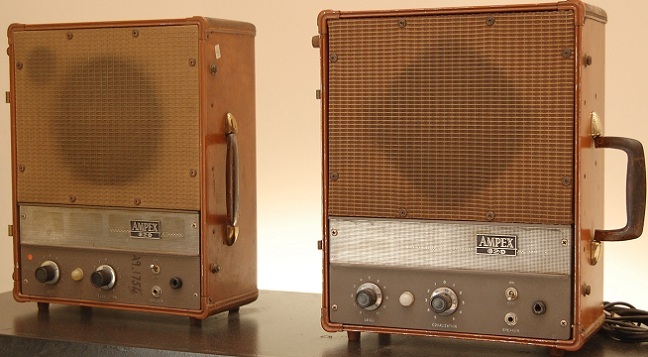 A companion to the Model 600 was an amplified loud speaker in a matching portable case, the Model 620, designed by George Brettell. To this day, many audio enthusiasts consider the 620 one of the most natural-sounding speaker systems ever made. The AMPEX Model 600 is a lightweight-portable magnetic tape recorder designed to meet the needs of both professional and non-professional users in remote pickups, custom home installations, and studio applications. The basic version of the Model 600; a 7-1/2 ips, full track, high impedance input portable recorder to be used with 117 v, 50 or 60 cps power. The Model 600 may be operated in either the horizontal or the vertical position. If the machine is left in its carrying case, "installation" consists only of making up and connecting the required cables. For studio installations, an adaptor (Cat. No. 9684) designed to permit mounting of the Model 600 in a standard 19-inch relay rack may be used. Foundational text courtesy of Ross H. Snyder and John Leslie from the AES Historical Committee paper, “History of The Early Days of Ampex Corporation” and AMPEX Corporation. Photo courtesy of Audio Engineering Society. 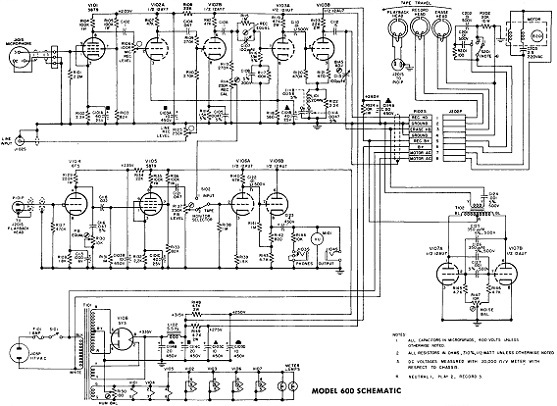 Schematic courtesy of AMPEX Model 600 Operation and Service manual. 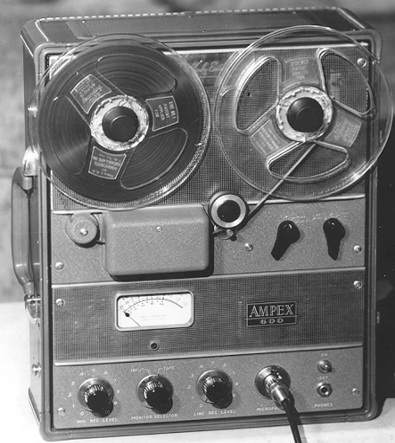 Do you have content, to add, about the Ampex Model 600 Tape Machine or associated topics? Please feel free to Share it, here!